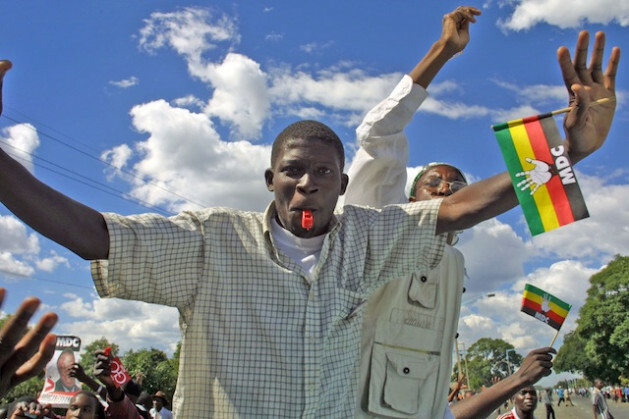 BULAWAYO , Apr 30 2013 (IPS) - As Zimbabwe’s young politicians increase their demands to be allowed to play a greater role in the running of the country, analysts say that this could signal a change in youth voter apathy in the upcoming elections. “Young people are beginning to see politics differently,” Tinaye Juru, a political analyst working in Bulawayo, told IPS. “We are seeing a shift from accepting being called tomorrow’s leaders to (having the youth) ask ‘Why wait till tomorrow, when we can do this today?’” Juru said. Elections in this southern African nation are expected sometime after Jun. 29 when the parliament’s term ends. And many feel this election could be an opportunity for young people to enter active politics as legislators – that is if their political parties yield to growing demands to include them more actively. Historically, young politicians here have been confined to campaigning for senior party officials. In a country where, according to the Zimbabwe National Statistics Agency, up to 60 percent of the population is under 35, this is a matter of great concern. There has already been an outcry within the Movement for Democratic Change led by Prime Minister Morgan Tsvangirai (MDC-T) against senior party officials who have not performed well. The party’s Youth Assembly, its youth wing, has demanded that the MDC-T hold its own primary elections to select candidates to contest seats for parliament in the upcoming elections. Previously, sitting candidates within the party did not face any internal contest for their seats in the legislature and simply sought re-election. But the MDC-T Youth Assembly has said that the youth could do a better job for the party and their country and suggested a youth quota for parliament. The same situation exists within the MDC led by Welshman Ncube, a breakaway faction of the original MDC. Aspiring candidates in its youth league ranks are being frustrated by officials who have dismissed them as “nuisances”, one youth wing member told IPS on the condition of anonymity. “We were asked, along with other aspiring candidates, by the party to submit our nomination papers for the primaries. But, curiously, our submission papers went missing,” he said. While on the other hand, President Robert Mugabe’s Zimbabwe African National Union – Patriotic Front (Zanu-PF), has been accused of suppressing the younger generation and preventing them from rising within the party’s ranks. A senior Zanu-PF youth league official in Bulawayo, who spoke on the condition of anonymity, told IPS that it was tough to break through the party’s glass ceiling as those who did not fight in the war of liberation were not highly rated by the party’s senior members. Between 1964 and 1979 Zimbabweans fought for independent rule from the then Rhodesian government of Ian Smith. “There are still old people in the party who think that if you challenge them in the primary elections, you are undermining them,” he said. But not all young people have welcomed the idea of being governed by their peers. “Young people have seen the benefits of public office from parliamentarians who are always demanding ridiculous perks from the (treasury),” Nathan Molife, a 22-year-old student at the National University of Science and Technology, told IPS. “Their motives have become marred by our politics where many believe no politician should be poor, never mind the level of poverty the people live in. Maybe I will vote for a younger MP, maybe I won’t. I don’t know,” Molife said, showing mistrust in politicians in general. According to a 2012 survey by Afrobarometer, an African research organisation, over the years a suspicion for politicians has become the major reason for voter apathy in Zimbabwe. According to the Zimbabwe Election Support Network, a mere 18 percent of young people of voting age have completed the registration process. And only an estimated 43 percent of registered young people voted in the disputed March 2008 election. According to international rights groups, including Human Rights Watch, Mugabe had perpetrated widespread violence against political opponents in the run-up to and after the country’s 2008 presidential elections. Mugabe was declared winner. Analysts said, however, that if young voters remained apathetic this year, it could set back attempts to actively engage the youth in the democratic process as candidates. “It would be fairly easy for young people to vote for one of their own, but if these same people do not register to exercise their (right to vote), it is difficult to see how the ambitions of creating a new breed of legislators will be realised,” Juru said. Tymon Ndlovu of the National Youth Development Trust, an NGO based in Bulawayo, told IPS that it was of concern that in the excitement to take up positions as legislators, female faces are missing. “Local politics remains male-dominated despite all the talk about equal representation. But I believe these elections would be an opportunity to see aspiring young female politicians coming out. But it’s obvious this is not happening,” he said. *This story was produced in conjunction with the Heinrich Böll Foundation and appears in their Perspectives report.